I ran my first marathon in 2013, and since then I have run 8 marathons and 3 ultramarathons. According to Running USA, there were about 541,000 marathon finishers in 2014. For most marathoners, myself included, the Boston marathon is considered the Holy Grail of marathon races. Nashville Rock and Roll 2013, my first marathon and it poured the whole time! So, what makes the Boston Marathon so attractive to runners? First, there is the history of the race, which dates back to 1897 as the oldest annual marathon in the world. The Boston Marathon is one of the six world marathon majors. (The world majors include London, Tokyo, Berlin, Chicago, New York, and Boston, and one day I want to run all of them!) It is also New England’s most widely viewed sporting event, with about 500,000 spectators annually. Then there is the qualifying process, which is just the carrot that a lot of runners can’t resist. A runner must complete a standard certified marathon course within a specified period of time, usually extending from September to September the year before the upcoming April race. The qualifying times were tightened in 2013 due to the number of registrants. For a female in the age bracket 18-34, which is my category, the qualifying time is 3 hours and 35 minutes. For a male in that same age bracket, the qualifying time is a speedy 3:05. The time standard increases by 5 minutes for each age bracket category. A table of qualifying times is below. It is a big accomplishment for a runner to Boston Qualify in itself, often called a “BQ”. Registration opens on a designated day in September where qualifying candidates are able to register with priority for faster times. The registration period typically lasts over a couple of weeks. For the last few years, the race filled up before all qualifying candidates were able to register. The 2015 race cut-off was set at 1:01 faster than qualifying time, and the 2016 race was set at 2:28 faster than qualifying time. This means that runners need to plan their BQ with margin for the cut-off. In 2016, 4,562 runners met the time standard, but were still not accepted. This is a disappointing reality for any runner, especially since the cut-off time is not determined until the actual registration takes place in September. About 1/5 of the entries are reserved for charities and sponsors with the expectation that these slots will raise about $10 million a year. There is also a special division for runners with disabilities. I ran my first marathon in spring 2013, and decided to try for a BQ in 2014. I chose the February 2014 Run with Donna marathon in Jacksonville, Florida, and finished with a time of 3:34:59, which was one second within the qualifying time. Knowing that I would probably need more margin that one second, I turned around and ran the Nashville Rock and Roll a few weeks later, but did not improve my time. Marathons require about a 6 month recovery time if you push your body for a best time, so I took my Nashville experience as a sign that I needed to give my body a break. In September of 2014, I registered for Boston 2015 with my time of 3:34:59, but the cut-off for the race was 1:01 shorter than my BQ time. Not to be discouraged, I decided to try again for 2016. The race period for 2016 was September 2014 through September 2015. In December 2014 I ran the Kiawah marathon in 3:29:36, which was faster than the required time by more than 5 minutes. My average pace throughout the race was 7:56 min/mi. I know that some people BQ on their first try, but it took me three marathons before I understood what it meant to train smarter and pace myself during a race. One month after I BQ’d, my husband and I got pregnant. We had planned to only try to get pregnant as long as I would have time to deliver a baby and still train for the race. I know, that may sound crazy to plan pregnancy around Boston, but my husband and I didn’t feel any real urgency to start a family right away. Fortunately, God knew what we needed more than we did, and He gave us the biggest joy of our lives. Cadence Joy Ussery was born on September 29, 2015. Six months later, I ran my first Boston Marathon on April 18, 2016. Every runner has their own race day routine, but I bet all of us start out the same way. Before even getting out of bed on Marathon Monday, I took inventory of my body. Those last couple of weeks before a race are most critical– we’ve put our bodies through so much, and we can’t have them failing us now! Race morning I woke up feeling great. Cadence had slept pretty well during the night, and I had been making an effort to get more sleep in the weeks leading up to this day, despite Cadence’s tough 6 month old sleep patterns. Nutrition for this race was a little different than I’ve encountered in the past because my start time was 10:50 am, meaning I’d be running through lunch time. I ate a piece of freshly milled, whole grain bread (thanks to my mom) and drank half a cup of coffee in the hotel. Before the race, I would also end up eating half of a bagel, a banana, a protein bar, and a caffeine shot (I don’t normally drink coffee, so wanted the added boost). I pumped/nursed about 19 oz of breastmilk before the 10:50 am start, so I was aware that I would need to replace fluids and calories, as well as eat enough for my body to keep producing and fuel my muscles while I ran. I felt good at the start, although I had been awake since 5 am. The weather was in the low 60s with full-on (beautiful but hot) sunshine. I wore a hat, tank top, tight shorts, and compression socks. Days before the race, I had been nervous that I would be cold, but this was obviously not going to be a problem. I describe the details leading up to the race and after the finish here if you want to get an idea of what the buses and Athlete’s Village were like. At 10:05 a.m., Wave 3 was called to start walking toward our corrals. I was in Corral 1, so I got up toward the front of the line. 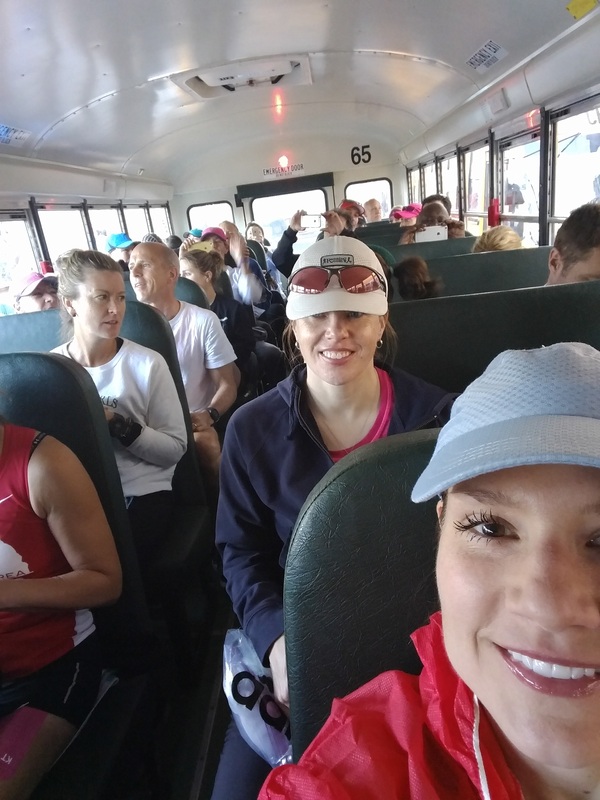 At 10:50 am the gun went off, and we all started running in Hopkinton. We ran as a pretty dense bunch of runners for the first mile or so, but the corrals are segregated by runner pace, so we were able to keep moving faster than I had anticipated. The first mile flew by (actually, most miles seemed to pass pretty quickly), and I completed it with a pace of 7:48 min, one of my slower splits. Throughout the race, I had to make sure that I ran my race and didn’t compare myself to the other runners around me, whether they were running faster or slower. It’s easy to start doubting yourself on the run! I anticipated the downhill at the beginning of the race, but I felt as prepared as I could for the beating my quads were about to take. My training had consisted of some trails and the stroller miles through my hilly neighborhood. As much as I did notice the downhills, the first miles of the race felt like hills with both uphill and downhill portions. The course runs through quaint towns in a fairly straight line all the way to Boston. The crowd support was phenomenal, with individuals, businesses, and armed forces all lining the path to Boston. For almost the entire race, there were crowds cheering us on, and I could smell barbecues grilling out along the way. I had my earphones playing my fast beat music, but for long stretches of the race, I could not hear it over the crowds. As much as I wanted a fast race, I also wanted to experience the marathon. Little kids lined the streets with their tiny hands outstretched for a high five, and I ran along the road high fiving as I went. It took extra energy in my legs, but it recharged my heart. I can’t wait until Cadence understands what I’m doing and stretches her little hand for a high five, mom! The girls at Wellesley did not disappoint with their whole bodies reaching over the course barricade requesting kisses and high fives. These girls may have been my favorite supporters along the course, as they clearly fulfilled their role in this historical race. They all looked so young, which made me realize all the more how removed I am from the college days! They gushed over me as a fellow female, and I loved every cheer and high five from their long line of outstretched arms. I won’t detail every mile or every town along the course, but I’ll highlight how I was feeling as the terrain changed. As I said before, the course starts relatively downhill, and I maintained a pace of about 7:35s for the first half of the race. 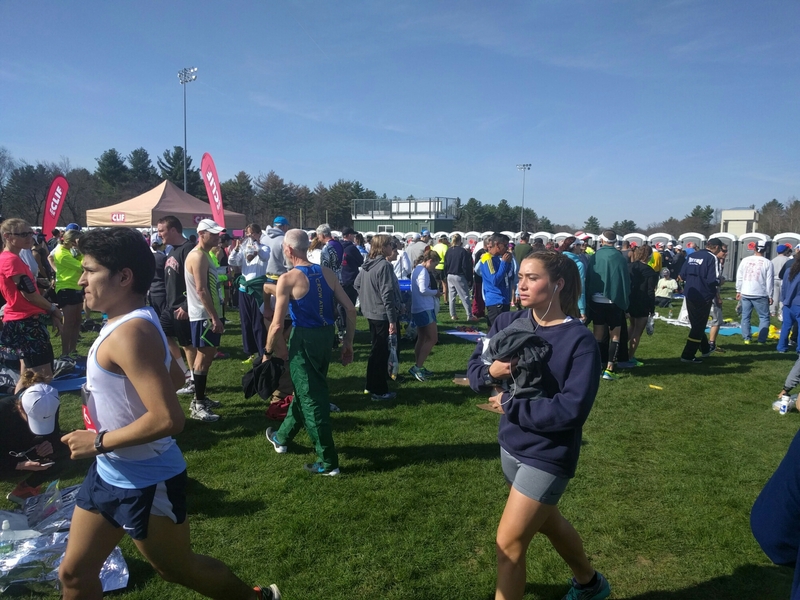 I knew that I was not running tangents, as my distance did not match the mile markers, but the course was too congested to attempt to weave to the most expedient route. I felt my quads within the first few miles, but I was running pain free. I pushed my pace just enough to feel discomfort, but only to the point where I knew that I was within my capability. One of the challenges of endurance running is knowing how hard to push given the distance to be achieved. The hills started to pile up in Newton right around mile 16. There is a lot of talk about Heartbreak Hill, but the hills in Newton leading up to that infamous hill are worth a little heartbreak of their own! My legs hurt going both up and down the hills, but I still felt strong and had confidence that I could power through, even if my pace slowed. My pace was closer to 8 minute miles in the range of 17-20 miles, and my slowest pace was 8:25 at mile 21. Heartbreak was not the worst hill to tackle, but it was the last big hill after a few miles of Newton hospitality! I maintained my nutrition by eating 3 gels and 1 Clif Shot Block pack. I typically would have eaten half of that, but I wanted to make sure to account for our later start time and the breastmilk that my body was busy making on the run. I also drank water or Gatorade at almost every aid station, which I normally do not do. The day was hot, and I knew that I needed to be intentional with hydration and breastfeeding. I felt very strong with this approach. I know that slowing at the aid stations to grab fluids affected my pace, but it also prevented me from blowing up and being dehydrated. I was not used to the obstacle course that became the aid station areas, as the discarded cups couldn’t easily be swept aside with so many runners. It was an added effort to pick up my feet and not trip as I grabbed a cup and ran. Again, all worth it, and the volunteers were phenomenal. Think of how long they stood out there! I am often nostalgic as races are coming to an end because I know that all of the training and anticipation is going to be over, but this time, I was ready to see my wonderful husband and sweet baby at the finish. I saw the famous Citgo sign in the distance around mile 23, and I knew that I would be at mile 25 when I reached it. By now, I was feeling pretty stiff as I forced my legs to keep pushing, but I had no doubt that I could keep running strong. My mile 25 pace was 7:53 and mile 26 was 8:16. I was able to speed up to sub-7 minute mile pace for the last stretch to the finish, and I finished with a final time of 3:24:05 and distance of 26.42 miles. My watch pace was 7:43 minutes/mile and my official race pace was 7:47 minutes/mile. My goal was to PR with a time better than 3:29:52, which I was happy to beat by over five minutes. I BQ’d at a very flat race with that time a month before I got pregnant. Six months post-partum, and I was able to BQ again with a faster time. My body has been through a lot over the last year, and I am grateful that it can serve as both a runner and a mother. I will probably have a runner’s high for a while after an experience like that. Everything about the race, from the organizers, to the crowd support, to the great city of Boston were absolutely phenomenal. I BQ’d again, so we’ll see what next year holds! One of my dearest friends prayed this verse over me, and I don’t think it could have been more perfect for race day. Today was much warmer than usual, and there was a nice head wind. Through it all, I felt strong, and I took hope in my Creator’s provision for me. I have been beyond blessed by friends and family supporting me as I’ve gotten back to training post-partum. I’ll write a race report later, but for now, I just want to get down a few of the highlights of the day. I boarded the bus at 7:45 am, along with all of the Wave 3 folks. I had been awake since 5 am, so this felt like a late start to the day! It was obvious already that the day would be warmer than expected. The guy in the white and blue jacket shaking hands in the picture below is Dean Karnazes! How cool! The bus ride was abuzz with nervous excitement and singing. It took us about 30 minutes to get to Hopkinton, and the whole time I was thinking about how we had to run all the way back! Athlete’s Village was held at a school with big tents set up on a big lawn. At 10:05 am all of the Wave 3 runners left the Athlete’s Village and headed to the start. I’m not sure how far we walked, but it was a little hike. And the start area provided more Porta Potties, this time with no lines. I was in Corral 1, so I got to start near the front. I actually didn’t realize that we were at the start line when the gun went off. For some reason I thought that we still needed to walk to another start line. Either way, we all started running in a pack, and I wouldn’t have been able to run a fast start anyway. We were concentrated for about a mile or two, and then it thinned enough to run my pace with a little dodging. I’ll write a race report later, but I did finish with my goal accomplished at 3:24:05. The course was challenging with the hills stacked at the end, plus heat and headwind. I was thirsty, and I know that my fluids were being diverted to make breast milk, as well as serving to cool me. But overall, I felt terrific and enjoyed every minute of every mile! It was really neat to run amongst other fast runners. And crowd support was phenomenal! I kept seeing signs that said “When your legs are tired, run with your heart,” which I think is a great race strategy. Jon was right at the finish with our adorable, perfect baby. I thought of them so much during the run. I am blessed beyond measure, and I think that running helps make me a better wife and mom. We had a good dinner without any wait for a table! There are a lot of locals out enjoying Marathon Monday too! So the Boston Marathon is complete, and we’ll go back to being tourists tomorrow before our flight. That is, assuming that I can walk. My legs are feeling the pain of a satisfying race, and I might lose my first toenail because of these Boston hills! That’s how we travel. After traveling all around the world, Jon and I have found that the best way to explore a city is on foot, with the occasional train ride or bus. This trip is very much about the marathon, evidenced by Jon’s devotion to cater to all of my needs and keep me happy, but we also wanted to enjoy this great city since vacationing will be a little less frequent with a baby in tow. First things first, we went back to the expo today so that I could meet Scott Jurek at the Clif bar venue. He is such a phenomenal runner, and he has made such an impact on the ultra world. Scott could not have been nicer, which is no surprise given his reputation of formerly winning races and waiting at the finish line for everyone else. Then we walked toward North End and ate at the Quincy Market area. The harbor was so beautiful, just like everything else in this city. My beautiful MIT friend met up with us and showed us around her stomping grounds. Jon taught his first class, and Cadence was his attentive student. She has really been such a doll baby during this whole trip. We finished off the day walking around Harvard’s campus and getting the best ice cream ever. My legs might be tired, but my brain feels smarter after walking the ivy league campuses! We are back in the hotel room now, and I’m just about ready for an early night to bed. Let’s hope Cadence cooperates! I’m excited and nervous about tomorrow. It’s hard to trust the training, and this training cycle has definitely been very unconventional. My goal is to PR, which means faster than 3:29. I feel like I am prepared for that kind of race, but I’m going to enjoy every minute of the race if things go differently. Travel day! We left for Boston today around noon and arrived at 2 pm. Cadence was such a perfect little sport through it all. She loves all of the sights and sounds, and she doesn’t mind being in her daddy’s arms one bit. Cadence earned her wings today for sure! We headed to the expo around 3:30 PM, and I was in heaven! It is so fun to be surrounded by such committed runners. Everyone is so nice, and we get even more special treatment when Cadence gives one of her big toothless smiles. I found the medical tent and received my special pass to bring a pump into the Athlete’s Village. I saw two other names on their list, and I desperately wanted to get a copy of their names so that we could band together in the awkwardness of pumping in a high security area with very little privacy surrounded by thousands of people. I’m not worried, but it will definitely be a first! Jon found just the right recovery tool. I think he might be ready to sign up for his next marathon if he could have one of these $5600 toys. It is so surreal that this weekend has finally arrived. I’m soaking up every minute and enjoying this beautiful city, the fabulous weather, and the uninterrupted family time. My final treat for the day was dinner with my gorgeous best friend who goes to MIT. Tomorrow we are tourists for the day!